This article is about the main element of a heraldic achievement, although "coat of arms" is often erroneously used to refer to its whole   . For the whole heraldic symbol, see Achievement (heraldry). For the album by Sabaton, see Coat of Arms (album). A coat of arms is a heraldic visual design on an escutcheon (i.e., shield), surcoat, or tabard. The coat of arms on an escutcheon forms the central element of the full heraldic achievement which in its whole consists of shield, supporters, crest, and motto. A coat of arms is traditionally unique to an individual person, family, state, organization or corporation. Heraldry is a broad term, encompassing the design, display, and study of armorial bearings, as well as related disciplines, such as vexillology, together with the study of ceremony, rank, and pedigree. Armory, the best-known branch of heraldry, concerns the design and transmission of the heraldic achievement. The achievement, or armorial bearings usually includes a coat of arms on an shield, helmet, and crest, together with any accompanying devices, such as supporters, badges, heraldic banners, and mottoes. In heraldry, an escutcheon is a shield that forms the main or focal element in an achievement of arms. The word is used in two related senses. A shield is a piece of personal armour held in the hand or mounted on the wrist or forearm. Shields are used to intercept specific attacks, whether from close-ranged weaponry or projectiles such as arrows, by means of active blocks, as well as to provide passive protection by closing one or more lines of engagement during combat. The Roll of Arms is a collection of many coats of arms, and since the early Modern Age centuries it has been a source of information for public showing and tracing the membership of a noble family, and therefore its genealogy across time. Nobility is a social class normally ranked immediately under royalty and found in some societies that have a formal aristocracy. Nobility possesses more acknowledged privileges and higher social status than most other classes in society. The privileges associated with nobility may constitute substantial advantages over or relative to non-nobles, or may be largely honorary, and vary by country and era. As referred to in the Medieval chivalric motto "noblesse oblige", nobles can also carry a lifelong duty to uphold various social responsibilities, such as honorable behavior, customary service, or leadership positions. Membership in the nobility, including rights and responsibilities, is typically hereditary. Genealogy, also known as family history, is the study of families and the tracing of their lineages and history. Genealogists use oral interviews, historical records, genetic analysis, and other records to obtain information about a family and to demonstrate kinship and pedigrees of its members. The results are often displayed in charts or written as narratives. The ancient Greek hoplites used individual insignia on their shields. The ancient Romans used similar insignia on their shields, but these identified military units. Hoplites(HOP-lites) were citizen-soldiers of Ancient Greek city-states who were primarily armed with spears and shields. Hoplite soldiers utilized the phalanx formation in order to be effective in war with fewer soldiers. The formation discouraged the soldiers from acting alone, for this would compromise the formation and minimize its strengths. The hoplites were primarily represented by free citizens—propertied farmers and artisans—who were able to afford the bronze armour suit and weapons. Hoplites were not professional soldiers and often lacked sufficient military training. However, some states did maintain a small elite professional unit, known as the epilektoi ("chosen") since they were picked from the regular citizen infantry. These existed at times in Athens, Argos, Thebes (Greece), and Syracuse, among others. Hoplite soldiers were relied on heavily and made up the bulk of ancient Greek armies of the time. Richard I was King of England from 1189 until his death. He also ruled as Duke of Normandy, Aquitaine and Gascony, Lord of Cyprus, Count of Poitiers, Anjou, Maine, and Nantes, and was overlord of Brittany at various times during the same period. He was the third of five sons of King Henry II of England and Duchess Eleanor of Aquitaine. 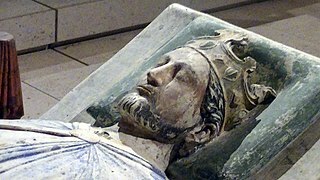 He was known as Richard Cœur de Lion or Richard the Lionheart because of his reputation as a great military leader and warrior. He was also known in Occitan as: Oc e No, because of his reputation for terseness. Burgher arms are used in Northern Italy in the second half of the 13th century, and in the Holy Roman Empire by the mid 14th century. In the late medieval period, use of arms spread to the clergy, to towns as civic identifiers, and to royally chartered organizations such as universities and trading companies. The arts of vexillology and heraldry are closely related. Burgher arms are coats of arms borne by persons of the burgher social class of Europe since the Middle Ages. By definition, however, the term is alien to British heraldry, which follows other rules. Vexillology is the study of the history, symbolism and usage of flags or, by extension, any interest in flags in general. The word is a synthesis of the Latin word vexillum ("flag") and the Greek suffix -logia ("study"). A surcoat or surcote initially was an outer garment commonly worn in the Middle Ages by both men and women in Western Europe. It can either refer to a coat worn over other clothes or the outermost garment itself. The name derives from French meaning "over the coat", a long, loose, often sleeveless coat reaching down to the feet. Despite no widespread regulation,[ citation needed ] heraldry has remained consistent across Europe, where tradition alone has governed the design and use of arms. [ citation needed ] Some nations, like England and Scotland, still maintain the same heraldic authorities which have traditionally granted and regulated arms for centuries and continue to do so in the present day. In England, for example, the granting of arms is and has been controlled by the College of Arms. Unlike seals and other general emblems, heraldic "achievements" have a formal description called a blazon, which uses vocabulary that allows for consistency in heraldic depictions. In the present day, coats of arms are still in use by a variety of institutions and individuals: for example, many European cities and universities have guidelines on how their coats of arms may be used, and protect their use as trademarks. Many[ citation needed ] societies exist that also aid in the design and registration of personal arms. The French system of heraldry greatly influenced the British and Western European systems. Much of the terminology and classifications are taken from it. 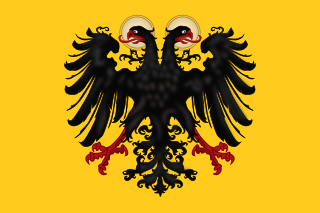 However, with the fall of the French monarchy (and later Empire) there is not currently a Fons Honorum (power to dispense and control honors) to strictly enforce heraldic law. The French Republics that followed have either merely affirmed pre-existing titles and honors or vigorously opposed noble privilege. Coats of arms are considered an intellectual property of a family or municipal body. Assumed arms (arms invented and used by the holder rather than granted by an authority) are considered valid unless they can be proved in court to copy that of an earlier holder. In Scotland, the Lord Lyon King of Arms has criminal jurisdiction to control the use of arms. In England, Northern Ireland and Wales the use of arms is a matter of civil law and regulated by the College of Arms and the High Court of Chivalry. In reference to a dispute over the exercise of authority over the Officers of Arms in England, Arthur Annesley, 1st Earl of Anglesey, Lord Privy Seal, declared on 16 June 1673 that the powers of the Earl Marshal were "to order, judge, and determine all matters touching arms, ensigns of nobility, honour, and chivalry; to make laws, ordinances, and statutes for the good government of the Officers of Arms; to nominate Officers to fill vacancies in the College of Arms; to punish and correct Officers of Arms for misbehaviour in the execution of their places". It was further declared that no patents of arms or any ensigns of nobility should be granted and no augmentation, alteration, or addition should be made to arms without the consent of the Earl Marshal. In Ireland the usage and granting of coats of arms was strictly regulated by the Ulster King of Arms from the office's creation in 1552. After Irish independence in 1922 the office was still functioning and working out of Dublin Castle. The last Ulster King of Arms was Sir Nevile Rodwell Wilkinson [Ulster King of Arms 1908–1940], who held it until his death in 1940. At the Irish government's request, no new King of Arms was appointed. Thomas Ulick Sadleir, the Deputy Ulster King of Arms, then became the Acting Ulster King of Arms. He served until the office was merged with that of Norroy King of Arms in 1943 and stayed on until 1944 to clear up the backlog. An earlier Ireland King of Arms was created by King Richard II in 1392 and discontinued by King Henry VII in 1487. It didn't grant many coats of arms – the few it did grant were annulled by the other Kings of Arms because they encroached upon their jurisdictions. Its purpose was supposedly to marshal an expedition to fully conquer Ireland that never materialized. Since 1 April 1943 the authority has been split between the Republic of Ireland and Northern Ireland. Heraldry in the Republic of Ireland is regulated by the Government of Ireland, by the Genealogical Office through the Office of the Chief Herald of Ireland. Heraldry in Northern Ireland is regulated by the British Government by the College of Arms through the Norroy and Ulster King of Arms. Coat of arms of the city of Vaasa, showing the shield with the Royal House of Wasa emblem, a crown and a Cross of Liberty pendant. In the Nordic countries, provinces, regions, cities, and municipalities have coats of arms. These are posted at the borders and on buildings containing official offices, as well as used in official documents and on the uniforms of municipal officers. Arms may also be used on souvenirs or other effects, given that an application has been granted by the municipal council. 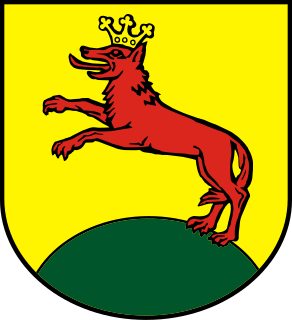 Coat of Arms of Liptov County in Slovakia. At a national level, "coats of arms" were generally retained by European states with constitutional continuity of more than a few centuries, including constitutional monarchies like Denmark as well as old republics like San Marino and Switzerland. In Italy the use of coats of arms was only loosely regulated by the states existing before the unification of 1861. Since the Consulta Araldica, the college of arms of the Kingdom of Italy, was abolished in 1948, personal coats of arms and titles of nobility, though not outlawed, are not recognised. 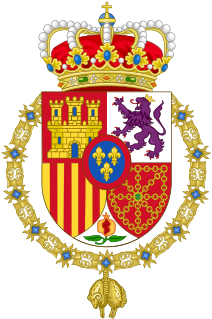 Coats of arms in Spain were generally left up to the owner themselves, but the design was based on military service and the heritage of their grandparents. In France, the coat of arms is based on the Fleur-de-lys and the Rule of Tinctures used in English heraldry as well. The Great Seal of the United States, which displays as its central design the heraldic device of the nation. The Queen of Canada has delegated her prerogative to grant armorial bearings to the Governor General of Canada. Canada has its own Chief Herald and Herald Chancellor. The Canadian Heraldic Authority is situated at Rideau Hall. The Great Seal of the United States uses on the obverse as its central motif an heraldic achievement described as being the arms of the nation. The seal, and the armorial bearings, were adopted by the Continental Congress on 20 June 1782, and is a shield divided palewise into thirteen pieces, with a blue chief, which is displayed upon the breast of an American bald eagle. The crest is thirteen stars breaking through a glory and clouds, displayed with no helm, torse, or mantling (unlike most European precedents). Only a few of the American states have adopted a coat of arms, which is usually designed as part of the respective state's seal. Vermont has both a state seal and a state coat of arms that are independent of one another (though both contain a pine tree, a cow and sheaves of grain); the seal is used to authenticate documents, whilst the heraldic device represents the state itself. The coat of arms of Pope John Paul II displays the papal tiara and crossed keys of the pontifical office. The Vatican City State and the Holy See each have their own coat of arms. As the papacy is not hereditary, its occupants display their personal arms combined with those of their office. Some popes came from armigerous (noble) families; others adopted coats of arms during their career in the Church. The latter typically allude to their ideal of life, or to specific pontifical programmes. A well-known and widely displayed example in recent times was Pope John Paul II's arms. His selection of a large letter M (for the Virgin Mary) was intended to express the message of his strong Marian devotion. Roman Catholic dioceses are also each assigned a coat of arms, as are basilicas or papal churches, the latter usually displaying these on the building. These may be used in countries which otherwise do not use heraldic devices. In countries like Scotland with a strong statutory heraldic authority, arms will need to be officially granted and recorded. Flags are used to identify ships (where they are called ensigns), embassies and such, and they use the same colors and designs found in heraldry, but they are not usually considered to be heraldic. A country may have both a national flag and a national coat of arms, and the two may not look alike at all. For example, the flag of Scotland (St Andrew's Cross) has a white saltire on a blue field, but the royal arms of Scotland has a red lion within a double tressure on a gold (or) field. Egyptian coats of arms showing common Near and Middle Eastern motifs, namely the crescent and stars which are symbols of the region's predominant religion, Islam, and Saladin's eagle. Among the states ruled by communist regimes, emblems resembling the Soviet design were adopted in all the Warsaw Pact states except Czechoslovakia and Poland. Since 1989, some of the ex-Communist states, as Romania or Russia have reused their original pre-communist heraldry, often with only the symbols of monarchy removed. Other countries such as Belarus or Tajikistan have retained their communist coats of arms or at least kept some of the old heraldry. With the formation of the modern nation states of the Arab World in the second half of the 20th century, European traditions of heraldry were partially adopted for state emblems. These emblems often involve the star and crescent symbol taken from the Ottoman flag. Another commonly seen symbol is the eagle, which is a symbol attributed to Saladin,  and the hawk of the Qureish. [ citation needed ] These symbols can be found on the Coat of Arms of Egypt and Syria. African flags and emblems after decolonisation often chose emblems based on regional traditions or wildlife. Symbols of a ritual significance according to local custom were generally favoured, such as the leopard in the arms of Benin, Malawi, Somalia, the Democratic Republic of the Congo and, in the form of the black panther, of Gabon. In Kenya, the Swahili word Harambee (lit. "Let us come together") is used as a motto in the country's coat of arms. In Botswana and Lesotho, meanwhile, the word Pula (lit. "Rain") is used in like fashion. In the coat of arms of Swaziland, a lion and an elephant serve as supporters. They are each intended to represent the king and the queen mother respectively, the nation's joint heads of state. 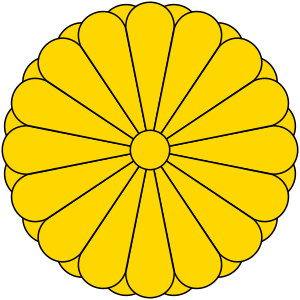 Japanese emblems, called kamon (often abbreviated "mon"), are family badges which often date back to the 7th century, and are used in Japan today. The Japanese tradition is independent of the European, but many abstract and floral elements are used. ↑ Stephen Friar (ed. ), A New Dictionary of Heraldry, London 1987. Alphabooks/A&C Black. ISBN 0-906670-44-6. P. 96. 1 2 "Educational Institute Coat of arms". October 2005. Retrieved 26 August 2015. ↑ "Policy on use of the Workmark and Insignia of McGill University" (PDF). 2000. Archived from the original (PDF) on 26 February 2015. Retrieved 26 August 2015. ↑ Employee Identification with the Corporate Identity International Studies of Management and Organization, Volume 32, Number 3, 2002 "Group Identity Formation in the German Renaissance". 20 August 2002. Retrieved 26 August 2015. ↑ Volborth, Carl-Alexander von (1981). Heraldry: Customs, Rules and Styles. Poole, England: Blandford Press. ISBN 0-7137-0940-5. ISBN 0-7137-0940-5 p.129. ↑ "The History of Heraldry in Canada". Royal Heraldry Society of Canada. 28 April 2004. Archived from the original on 6 March 2009. Retrieved 21 August 2008. ↑ "The Canadian Heraldic Authority". Canadian Heraldic Authority. 2015. Retrieved 2015-08-26. ↑ "2004 Seal Broch" (PDF). July 2003. Retrieved 26 August 2015. ↑ "Coat of arms of His Holiness Benedict XVI". 2015. Retrieved 26 August 2015. ↑ "Vatican press office". 9 June 2013. Retrieved 27 August 2015. ↑ "Coat of Arms (Eagle of Saladin)". Macaulay Honors College. 5 April 2011. Retrieved August 19, 2015. 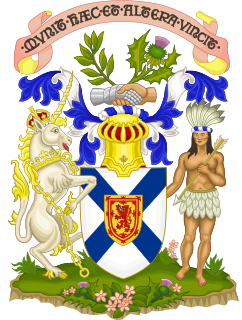 The coat of arms of Nova Scotia is the heraldic symbol representing the Canadian province of Nova Scotia. It is the oldest provincial achievement of arms in Canada, and the oldest British coat of arms in use outside Great Britain. It is blazoned as follows: Argent, a saltire azure charged with an escutcheon of the Royal Arms of Scotland. King of Arms is the senior rank of an officer of arms. In many heraldic traditions, only a king of arms has the authority to grant armorial bearings and sometimes certify genealogies and noble titles. In other traditions, the power has been delegated to other officers of similar rank. The Canadian Heraldic Authority is part of the Canadian honours system under the Canadian monarch, whose authority is exercised by the Governor General of Canada. The authority is responsible for the creation and granting of new coats of arms, flags, and badges for Canadian citizens, government agencies, municipal, civic and other corporate bodies. The authority also registers existing armorial bearings granted by other recognized heraldic authorities, approves military badges, flags, and other insignia of the Canadian Forces, and provides information on heraldic practices. The law of heraldic arms governs the "bearing of arms", that is, the possession, use or display of arms, also called coats of arms, coat armour or armorial bearings. Although it is believed that the original function of coats of arms was to enable knights to identify each other on the battlefield, they soon acquired wider, more decorative uses. They are still widely used today by countries, public and private institutions and by individuals. The earliest writer on the law of arms was Bartolus de Saxoferrato. The officials who administer these matters are called pursuivants, heralds, or kings of arms. The law of arms is part of the law in countries which regulate heraldry, although not part of common law in England and in countries whose laws derive from English law. Norwegian heraldry has roots in early medieval times, soon after the use of coats of arms first appeared in continental Europe. Some of the medieval coats of arms are rather simple of design, while others have more naturalistic charges. The king-granted coats of arms of later times were usually detailed and complex. Especially in the late 17th century and the 18th century, many ennobled persons and families received coats of arms with shields containing both two and four fields, and some even with an inescutcheon above these. The tradition and art of heraldry first appeared in Spain at about the beginning of the eleventh century AD and its origin was similar to other European countries: the need for knights and nobles to distinguish themselves from one another on the battlefield, in jousts and in tournaments. Knights wore armor from head to toe and were often in leadership positions, so it was essential to be able to identify them on the battlefield. Danish heraldry has its roots in medieval times when coats of arms first appeared in Europe. Danish heraldry is a branch of the German-Nordic heraldic tradition. 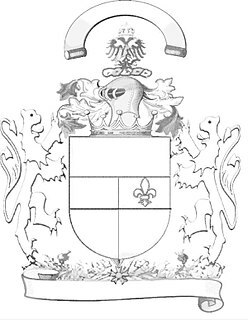 German heraldry is the tradition and style of heraldic achievements in Germany and the Holy Roman Empire, including national and civic arms, noble and burgher arms, ecclesiastical heraldry, heraldic displays and heraldic descriptions. German heraldic style is one of the four major broad traditions within European heraldry and stands in contrast to Gallo-British, Latin and Eastern heraldry, and strongly influenced the styles and customs of heraldry in the Nordic countries, which developed comparatively late. Together, German and Nordic heraldry are often referred to as German-Nordic heraldry. A heraldic authority is defined as an office or institution which has been established by a reigning monarch or a government to deal with heraldry in the country concerned. It does not include private societies or enterprises which design and/or register coats of arms. Icelandic heraldry is the study of coats of arms and other insignia used in Iceland. It belongs to the German-Nordic heraldic tradition, as the heraldry of Iceland has been primarily influenced by the heraldic traditions of Norway, Denmark and other Nordic countries. Iceland does not have a strong sense of heraldic tradition, however, because the country lacks a governing body to oversee this. As a result, coats of arms registered as such are virtually nonexistent in modern Iceland. While many municipalities use more or less heraldic logos, there are no heraldic standards to which these must adhere, and they are registered as graphic designs rather than as coats of arms. Russian heraldry involves the study and use of coats of arms and other heraldic insignia in the country of Russia since its formation in the 16th century. Compare the socialist heraldry of the Soviet period of Russian history (1917–1991). A national coat of arms is a symbol which denotes an independent state in the form of a heraldic achievement. While a national flag is usually used by the population at large and is flown outside and on ships, a national coat of arms is normally considered a symbol of the government or the head of state personally and tends to be used in print, on heraldic china, and as a wall decoration in official buildings. 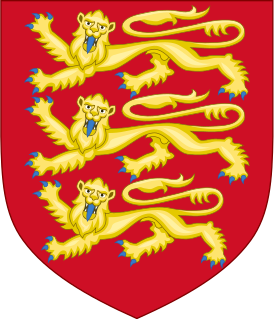 The royal arms of a monarchy, which may be identical to the national arms, are sometimes described as arms of dominion or arms of sovereignty. Heraldry is the system of visual identification of rank and pedigree which developed in the European High Middle Ages, closely associated with the courtly culture of chivalry, Latin Christianity, the Crusades, feudal aristocracy, and monarchy of the time. Heraldic tradition fully developed in the 13th century, and it flourished and developed further during the Late Middle Ages and the Early Modern period. Originally limited to nobility, heraldry is adopted by wealthy commoners in the Late Middle Ages. Specific traditions of Ecclesiastical heraldry also develop in the late medieval period. Coats of arms of noble families, often after their extinction, becomes attached to the territories they used to own, giving rise to municipal coats of arms by the 16th century. Pimbley, Arthur Francis (1908). Pimbley's dictionary of heraldry. Pimbley. Wikimedia Commons has media related to Coats of arms . College of Arms: Repository of the coats of arms and pedigrees of English, Welsh, Northern Irish and Commonwealth families and their descendants together with, and in principle under the control of, the legal body the Court of Chivalry, both medieval in origin.